Well hello. This new Japanese trailer for STAR WARS: THE FORCE AWAKENS looks stunning! Many new scenes and not too much given away regarding spoilers - although more than what we're used to from Abrams. Certainly there are visual spoilers and characters have their closeups but don't be worried about learning too much of the storyline. That being said, this trailer goes into more depth than the domestic materials so as usual you are being warned. And... the poster is new as well! 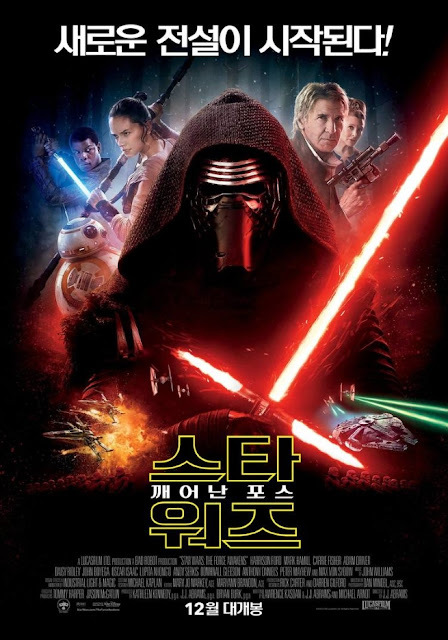 Adam Driver's Kylo Ren dominates the new Korean poster and it looks sensational. SWTFA is going to look amazing in 3D. I've got that feeling. I think everything about this movie is going to be perfect. The story, the imagery, the soundtrack, the characters, the soul. The pressure on JJ Abrams to deliver this thing must be off the scales, but he seems to be taking everything in stride. I've seen the domestic trailer in IMAX and it brings chills. Can't wait for its 3D. I've already have my ticket bought for opening night and I urge you to buy ahead of time as well. You'll want to see this thing early to 1. enjoy it and 2. avoid the spoilers that will undoubtedly be flying EVERYWHERE on social media the day after opening. STAR WARS THE FORCE AWAKENS opens on December 17.